Pianist Mitch Woods has long been under the sway of the New Orleans piano tradition and has recently moved to the city, where he’s been a presence at local clubs and festivals. He was part of the Legendary Rhythm & Blues Cruise that landed in the city last month for a mini-festival of its own. The Cruise, run by Kansas City promoter Roger Naber for the last 25 years, is a floating party that tests the limits of both performers and listeners over its week-long runs. Woods has been a steady contributor to these events, and his latest album offers a glimpse at the kind of jam sessions that take place during the cruises. Woods tells tales of getting a late-night call to return to the piano bar and jamming in his pajamas until dawn. “To be sailing in the Caribbean at five in the morning with Tab Benoit banging on a bus tray, Charlie Musselwhite and Rick Estrin blowing harp, and Shemekia Copeland shoutin’ the blues is priceless,” says Woods. Back in January, Woods decided to make a record out of these free-for-alls, and the result, Jammin’ On the High Cs, is big fun. Woods runs down the history on “Story of Club 88” and cuts loose with fellow cruisers Roomfull of Blues, Lucky Peterson, Dwayne Dopsie, Billy Branch, Coco Montoya, Popa Chubby and others. 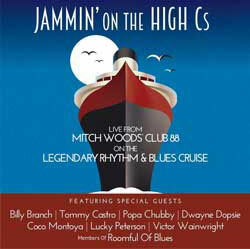 If you can’t book a ticket for the Legendary Rhythm & Blues Cruise, this is the next best thing to it. Put on your pajamas, pour yourself an adult beverage and imagine yourself cruising along the Yucatan.